(May 1, 2018, Lauderdale Lakes, FL) Last year Hurricane Irma ripped through south Florida and not only devastated property but also caused power outages that took the lives of several residents in a nursing home in Hollywood, FL. These tragic losses created rapid response from Tallahassee. Following the deaths, Governor Scott issued emergency rules mandating generators at nursing homes and assisted facilities. Nursing homes would be mandated to have equipment that can control indoor temperatures for 96 hours after an outage and maintain an ambient temperature of no more than 81 degrees. 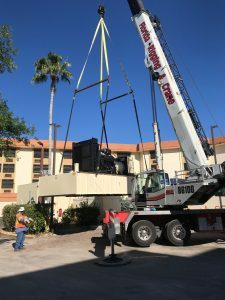 As a proactive corporate initiative, months prior to the Governor’s mandate, Catholic Health Services had been on the path to equip all medical campuses, including nursing homes, rehabilitation hospitals and assisted living facilities with generators to provide full facility power. 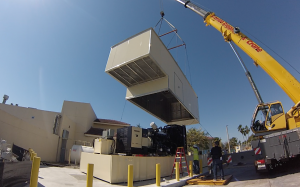 Moving quickly, management at Catholic Health Services engaged architecture and engineering firms to design custom systems and plans, build required infrastructure, order, fabricate, deliver and install commercial grade, customized generators. Much of the ground work was completed before the end of 2017 and at this time the project has fulfilled the 100% coverage requirement. Although there were numerous logistic and regulatory challenges to be met, all of our medical campuses will be fully operational and compliant with the Governor’s rules ahead of this year’s hurricane season. The leadership and staff of all Catholic Health Services facilities, make it the utmost priority to establish a safe and comfortable environment for all patients, residents and clients, above and beyond the standard industry life safety requirements. “We have taken every precaution to ensure that our skilled nursing, rehabilitation hospitals and assisted living facilities remain safe and operational during and after a storm. Our priority is to ensure the comfort and peace of mind for you and your loved ones. Catholic Health Services is ready to provide Always ON protection at our four medical campuses for any emergency and hurricane season.” said Joe Catania, CEO, Catholic Health Services.